Wire Curler Tool ~ This simple tool for working with wire is so easy to use, comes in small 1/8", medium 1/4" and large, 3/8". Just insert tip of wire into metal groove and begin to twist- makes uniform curling, tight or loose. Works well with small or large gauge wire. This is a popular item at the conventions when people see how easy it is to use. TIP~You can really get some cool looks with wire curler if you curl 2 or more different colors of wire at a time. Tip - Use your curled wire for doll hair. Try your wire as a binding for books. For small books with a card stock cover, use eyelets at the hole binding and use your wire thru the eyelets for a great look (add beads too!) Use your wire to wrap around an embellishment you are adding to your artwork- sea glass, fancy pebbles, beads dominoes, etc.. Add it in your polymer clay. If you wish to pound coated wire flat, be sure to use a hammer made of plastic or cover your hammer so it will not remove the color. After curling your wire and sliding off the tool, flatten it in your hands and you can get some very nice free form looks with it like flowers. Wire Writing Tool~If you have ever tried to create a word in wire, you know it is not easy. This tool makes wire writing fun and easy. It comes with 2 practice spools of wire, 5 yds. ea. and a paper jig. What is so nice about this tool is that the wire spool attaches on the top and you thread it down through a groove in the body and push thru bottom. It is like having a pen in your hand that has wire coming out instead of ink. I tried this tool at the Hobby Industry Assoc. show in Dallas, Feb 04, at a make and take it. I really liked the ease of use, especially since I had taken a class where we did do wire writing but without this tool and it was definetly something you would need to practice to master. I like quick and easy, low maintenance type items and projects. 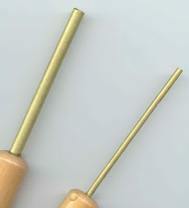 Wire Worker Tool~ If you have wanted to make those cool looking coil beads, this is your tool. It comes with handles, 6 mandrels and a small bit of wire and directions. You can then make single coil beads, double and triple coil beads. Put your supply of wire to work on those art and scrapbooking projects. It's easy when you have the right tool for the job. Tip- The higher the number gaugeof wire, the thinner the wire is. Example - 26 gauge wire is thinner than 18 gauge wire. Wire Swirls & Wire Beads can be found on our Jewelry Making Page.